The Shark NV501 is one of the most highly-reviewed vacuums in its price range. It has a lift-away feature and can transform between a canister and upright vacuum. Most of the vacuum is made of plastic, so it’s fairly lightweight at 15.5 pounds. There are LED lights attached to the bottom that illuminate the surfaces while you clean them. The Shark NV501 comes with a whole host of different accessories. You’ll get the power brush for pet hair and dander, the multipurpose tool, the crevice tool, the wide upholstery tool, and the straight suction floor nozzle. With all of these different tools and wands, you should be able to vacuum any dirt or debris off of any surface. The vacuum has an anti-allergen seal and filter that traps dust inside of the vacuum instead of stirring it up inside your house. It also has an advanced swivel steering feature, so you can easily maneuver through tight areas. One of the best features of this vacuum is its ability to switch between being an upright and a canister vacuum. It comes with a caddy that you attach the canister to. You can either carry it around with the cleaning wand detached, or you can attach the wand to the top of the canister and roll the entire thing around as an upright vacuum. All the different attachments and accessories fit onto the caddy, and switching between canister and upright is quick and easy. There are only a few common complaints about the Shark NV501. A couple users have mentioned issues with the canister toppling over when the wand is detached. Because it’s made of a lightweight plastic and the hose isn’t very flexible, pulling on the hose too hard may bring the canister down. There are also a few reports of some plastic parts breaking after a few uses, but the manufacturer offers a five-year warranty that should cover those issues. Overall, the Shark NV501 is a top-notch vacuum. Virtually all reviewers agree that it has a good cleaning performance and is stronger than the average vacuum. It’s easy to carry around and maneuver, and it picks up pet hair, dust, and debris from the toughest places. If you need a flexible vacuum with a variety of attachments, the Shark NV501 is one of your best choices. 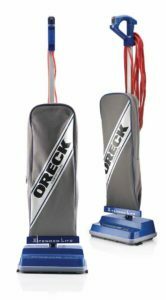 The Oreck Commercial XL is an upright vacuum with a 12-inch wide cleaning path. It has an automatic floor adjustment feature, so the vacuum can switch from carpet to hard surfaces without you needing to manually change the settings. However, the brush roll doesn’t turn on or off, so the vacuum will scratch up your hardwood floors if you leave it stationary. It works well on hard surfaces, but it’s mostly designed for use on carpeted floors and is best for people who have wall-to-wall carpeting. The vacuum includes attached side edge brushes that help you clean corners and baseboards. It also has non-marring bumpers, which protect your baseboards and furniture from scratches, dings, or other marks if you accidentally bump into them. The cable is 35 feet long, so you can cover a wide area without needing to switch plugs. The Oreck Commercial XL only weighs 8.2 pounds, so it’s very easy to pick up and carry around your home. It uses Oreck’s special Helping Hand Handle, which is comfortable and ergonomic. You don’t have to squeeze the handle tightly or bend your wrist to maneuver, so this vacuum is a good option for people with arthritis. The vacuum uses disposable top-fill bags, which makes emptying the vacuum much easier. The bags prevent allergens from escaping into your home as you empty the vacuum, too. This does mean that you have to purchase the bags, though. A pack of 25 bags only costs about $20, so most people think that it’s worth it for the top-filling bag feature. It’s up to you whether you like this feature enough to make the extra purchase. Unfortunately, the Oreck Commercial XL doesn’t come with a hose or other attachments to clean furniture. You can only use the vacuum on the floor. 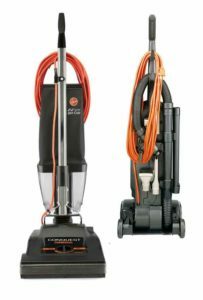 Compared to some other vacuums that come with several different wands, tools, and accessories, the Commercial XL is limited in its capabilities. You’ll need to replace the belts every six months, too, which is another added expense. Those issues are inconvenient, but they don’t have anything to do with the way the vacuum functions. The Oreck Commercial XL is one of the best vacuums for carpeted areas. It’s fast and powerful, and users say that it’s especially good for pet hair. If your home is mostly carpeted, this vacuum is a great option. The Commercial WindTunnel is one of Hoover’s most popular vacuums. It has a 13-inch cleaning path and comes with a 12-inch wand, an 11-inch crevice tool, and a dusting and upholstery brush. The power cord is 35 feet, which gives you a long reach. There are five different height positions that you can manually switch between based on your carpet height. It’s a bagged vacuum, so you’ll have to buy replacement bags occasionally. This vacuum uses Hoover’s patented WindTunnel technology. It has three air tunnels that remove dirt and debris that are embedded into the surface. The vacuum has particularly strong suction, and many users say that it’s more powerful than any other vacuum they’ve had. The handle reclines enough that you can easily clean under tables, chairs, beds, or lifted couches. It includes an allergen filtration system, so you don’t have to worry about stirring up dust or dander throughout your house. It also has a furniture guard that helps you avoid scuffing your furniture, walls, or baseboards. The biggest problem with the Hoover Commercial WindTunnel is its weight. It weighs about 20 pounds, which is lighter than some heavy-duty commercial vacuums, but it still might be tough to carry around. It’s noisier than the average vacuum, too, so you should consider wearing ear protection while you use it. Some reviewers mention that the attachment hose is stiff, which makes it tiresome to use. If you’re okay with putting a little extra physical effort into vacuuming, the Hoover Commercial WindTunnel is an excellent option. For the price, it provides plenty of power. It’s heavy because it’s strong, and it does a good job of picking up dirt, debris, and pet hair that’s embedded deep in carpeting or upholstery. The ProTeam Super CoachVac is designed for heavy-duty commercial use in places like schools or large offices. It’s a canister vacuum with a backpack harness that should distribute the weight evenly around your body. The vacuum only weighs 11 pounds, so it shouldn’t cause fatigue. It does blow warm air near your back, though, so you should prepare to be a little sweaty even though it’s lightweight. 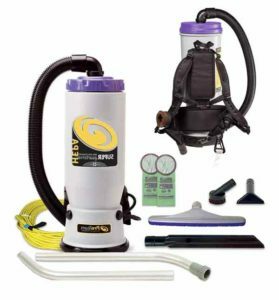 The CoachVac comes with a wide variety of accessories that all attach to the harness. You’ll get a crevice tool, upholstery tool, soft dusting brush, and telescoping wand. It works equally well on hardwood floors, carpeting, and upholstery. The allergen filtration system effectively traps dust and dander and prevents it from getting stirred up in the air. All of the best features of the CoachVac make it a great option for big commercial spaces. The vacuum has a 10-quart filter, which is much larger than the standard upright vacuum. You can use the vacuum regularly on large areas for several weeks or even months without needing to change the bag. It has a 50-foot power cord, so you can cover a wide area without unplugging the vacuum. Although the CoachVac is exceptionally powerful, it’s also surprisingly quiet. According to the manufacturer, it’s only 66 decibels, which is about the volume of a normal conversation. There are very few reported issues with the CoachVac. The plastic hose seems to be made of poorer quality plastic than the rest of the vacuum, and a few reviewers mention it breaking easily. The tools also sometimes fall off of the harness, which can be irritating. Besides these two small issues, though, users are completely happy with the vacuum. If you have a large area to cover in a short time, the ProTeam Super CoachVac is one of your best options. It’s more expensive than the other vacuums on this list, so it’s probably an impractical purchase for the average home. For commercial use, though, the vacuum is worth every penny. It’s lightweight, powerful, and durable. The Sanitaire SC679J is a 12-pound upright vacuum with a 12-inch cleaning path. It has an automatic locking handle with a foot pedal release, and it can recline far enough to clean underneath furniture. The vacuum comes with a furniture guard bumper, so you won’t risk damaging your walls or furniture by bumping into them. It’s quieter than most vacuums at 78 decibels. You may not be able to talk over it, but it won’t irritate your ears. The SC679J uses a four-gallon shake-out bag, which you can empty and reuse. You don’t have to spend extra money on disposable bags, and it has the added benefit of being eco-friendly. The bag is large, but it’s not filtered. Therefore, you should probably empty it before it fills up all the way. A few reviewers mention a bad smell from the bag when it goes unemptied for a few weeks, even if it’s not full. Emptying it regularly will help you avoid this problem. One of the reasons the Sanitaire is less expensive than similar vacuums is because it doesn’t come with extra tools or attachments. All of the features it comes with work well, but you won’t be able to vacuum upholstery, and it may be difficult to vacuum stairs, baseboards, or tight corners. The vacuum is best for people who mostly need to clean open floor space. It comes disassembled, too, and putting it together might be a little tricky. You’ll get a user manual with instructions, but you should prepare to spend some time and energy assembling the vacuum. The Sanitaire SC679J is one of the best budget vacuum cleaners. It doesn’t come with as many attachments or accessories as some other units, but it has all the important features of a standard vacuum. If you just need a vacuum that will effectively clean your floors, this is a great option that won’t break the bank. Commercial vacuums are more powerful and efficient than standard vacuums. They’re designed for regular use in large spaces like schools, hotels, and restaurants, so they won’t tire out as quickly as residential units. If you own a commercial location or run a janitorial service, a commercial vacuum is an essential appliance. They can be helpful tools for homeowners, too, especially in homes that collect lots of dust or pet hair. Before buying a commercial vacuum, there are a few decisions you need to make. The first is whether to buy an upright or a canister vacuum. Uprights are the traditional models you probably picture when you think of vacuum cleaners. They’re one large unit with the bag or canister sitting on top of the cleaning head. These vacuums are easier to transport than canister vacuums because you only have to push or carry the single unit. Canister vacuums have a cleaning head that attaches to the bag with a long hose. While you push the cleaning head around, you can pull the canister behind you. These vacuums are better for cleaning underneath furniture because the cleaning head and handle are detached from the canister. The cleaning head is lighter and easier to maneuver, too. When you need to move around, though, you’ll have to hold the cleaning head in one hand and pull or push the canister in the other. You’ll also have to choose between a bagged or a bagless vacuum cleaner. If you have a bagged vacuum, you’ll have to buy the disposable bags, which is an extra expense. Bagless vacuums have filters that need to be replaced occasionally, though. Emptying a bagless vacuum can be dusty and messy as well. If you have allergies or asthma, your symptoms may get worse when you empty a bagless vacuum. Most vacuums come with at least a few attachments, but you should choose a vacuum that has all the attachments you need. Do you need to clean furniture or upholstery? If so, you should find a vacuum with an upholstery attachment. Do you need to clean stairs or tight corners? Some vacuums have crevice tools that make it much easier to clean along edges or corners. Consider whether you’ll be using the vacuum more on carpeting or on hard surfaces. Some vacuums are designed to be used on one or the other, and some work well on both. If you need a vacuum for carpeting, you may want to find one with a height adjustment feature. This will change the height of the brushroll based on the depth of the carpet, which helps with thorough cleaning. Volume is another important factor. Many of today’s vacuums are much quieter than the vacuums of the past. Some are still fairly noisy, though. If you’ll be using it for a long time every day, a loud vacuum could affect your hearing. If you’ll be vacuuming in a commercial location while other people are around, it’s important to find a quiet model, too. The manufacturer should provide the decibel level for the vacuum. A normal conversation is about 60 to 65 decibels, a hair dryer is about 80 decibels, and a garbage disposal is about 88 decibels. Ideally, your vacuum cleaner should be less than 70 decibels, but anything less than 80 will be okay. If you’re looking to buy a commercial vacuum, chances are you’ll be spending a lot of time with it. You should make sure whichever vacuum you choose is the best possible model for you and for the space you need to clean. 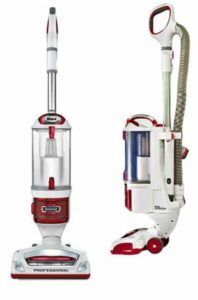 How do you know which vacuum is best? The Shark NV501 is a good choice if you want lots of features and accessories. 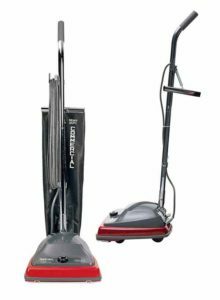 If you need a heavy-duty vacuum for larger areas, the CoachVac or the Hoover WindTunnel may be better. For wall-to-wall carpeting, the Oreck Commercial XL is the way to go. If you want a basic vacuum without all the bells and whistles, the Sanitaire is a good choice. Every model on this list has excellent user reviews from professional cleaners, so as long as you make a careful decision, you should be happy with your purchase.